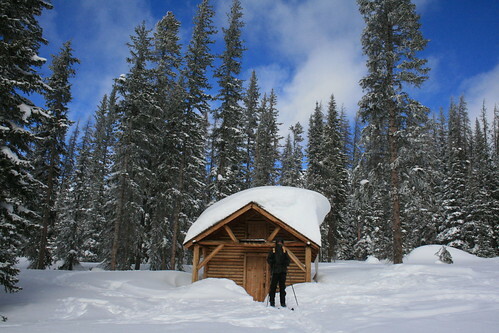 Romy stands in front of the Snow Survey Cabin in the Snowy Range, Wyoming. The next part of our winter break trip took us from the mountainous western side of Wyoming across its high flat plains in the central part of the state, to the south east where the mountains again returned. As we drove, if this part of the trip had a theme, it would be blowing snow, numbingly cold winds, and snow fences! I remember when I didn't know what snow fences were. Growing up in the midwest, we didn't have real snow fences. But after you go out to the central plains (i.e. Wyoming) you can really appreciate what they do (or at least attempt to do). The central plains are extremely flat, but they are also at high elevation. The continental divide runs right through the middle of Wyoming, through some of the flattest parts! How can this be the continental divide when its so flat, I thought. Well, then I realized that the central plains of Wyoming are at 7,000 plus feet! Rain that falls on the west side of the divide in Wyoming will go toward the Pacific Ocean, while rain that falls on the east side of the divide will drain to the gulf or the Mississippi. 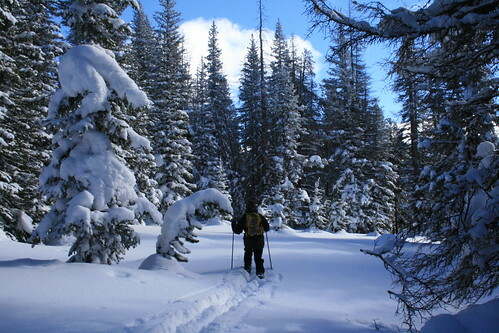 Since the central plains are so high in elevation, they get a lot of snow in the winter and it gets really cold! When we were driving though, the highs were only in the single digits. The lows over night were between -10 and -20F. Add in the crazy winds that blow non-stop across the flats and you have crazy winter weather. Blowing snow, numbingly cold winds, and snow fences! Inside the Snow Survey Cabin. As we drove, the endless blindingly white fields kept a steady supply of snow to the wind, which was constantly picking it up and blowing it all over the place, including the road. It was the neatest thing to see! The snow is very light and powdery, and the wind that ran across the road made the coolest swirling patterns. You could see all of the streamlines and it seemed as if the flow was creating laminar patterns. They constantly evolved before your eyes, swirling ribbons of white. The horizon in all directions had a haze of drifting snow. It made for a spectacular sunset. The flatness and wide open sky allowed us to see the sun setting clearly behind us, and as the last light of day passed through the low haze of blowing snow, it turned the entire surface pink, orange and red! It was like all the blowing snowflakes reflected the lights of the sunset at you from all directions! Snow fences are supposed to break up the wind so that the snow it is carrying can fall out and get deposited behind the fence. So many of the fences were already at capacity, so the blowing snow kept blowing. In some places, living snow fences (made of a line of planted trees) were being built as an experiment. 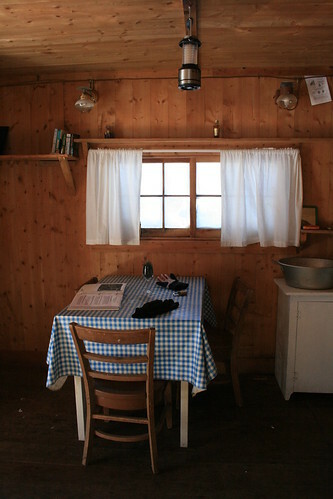 The small but well equipped kitchen inside the Snow Survey Cabin. We were on our way to the Snowy Range, a mountain range in the south east part of the state. We rented out another cabin in the Medicine Bow National Forest which used to be a snow survey cabin. The reason why snow surveying was so important back then (and still is today) is because the amount of snow that falls in these mountains during winter will determine how much water will be returned to the aquifer, or flow through creeks and rivers in the spring. Its important to farmers and ranchers of the central Wyoming plains. 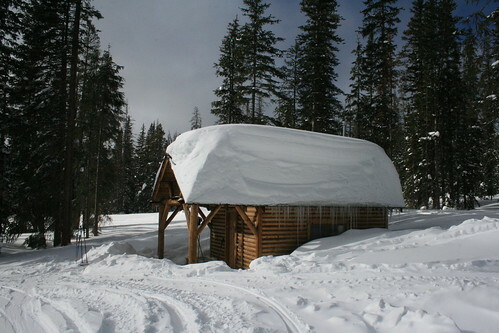 The outhouse was almost completely buried under snow! Government workers used to go to the mountains and measure the snow depth and its water content a few times each winter by ski or snowshoe. This was a pretty rough trip, since it meant the workers would need to set up camp. Later on, they used snowmobiles, but some places were still only accessible by ski or snowshoe, so this didn't really give much of an advantage. One day a scientist making regular snow survey trips decided it would make sense to build small snow survey cabins in the mountains so that the workers could have a home base of operations. 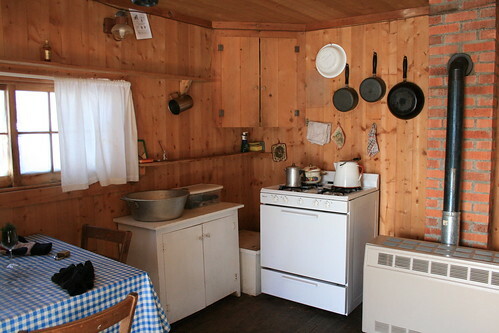 The cabin plans were standardized, and the government began building them all over the west. When surveying operations began to get more remotely operated, by setting up instrumentation instead, the cabins were no longer needed. Some of them are now rented out by the government, like this one that we were about to stay at. A beautiful view from the cabin - sunset! Just like the other cabin (Stump Creek) we stayed at, we had to ski one mile to get to it because the road was not plowed. However, the entire road was groomed for snowmobilers and skiers, so it was pretty straight forward. After we loaded up our pulk with all the stuff we would need, we headed up the road to find the cabin. The day we set out was very windy and snowy. We knew we couldn't see the cabin from the road, so we kind of had to guess how far we had skied. About one mile in, we saw a stop sign on the left side, so we figured that the cabin must be somewhere off in the forest from where the stop sign was, since in the summer you can drive to the cabin. We saw a snowmobiler path that went off into the forest, so we followed it and it ended up leading to the cabin! When we got there, the cabin was buried half way by snow (literally, the windows which were at eye level from inside were almost snowed over on the outside). The roof had a thick covering of snow which could of buried you alive if it decided to fall off while you were standing next to the cabin. The previous visitors made a snow staircase down to the main cabin door. There was also a hatch door a few fee above the main door in case you needed to enter the cabin if it was entirely snowed in! 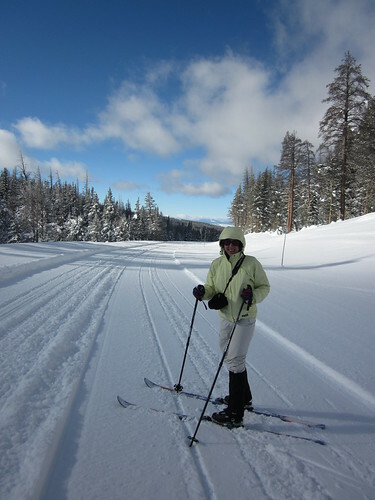 Wyoming Hwy 130 is groomed in the winter for skiers and snow mobilers. The inside had two bunk beds, a table, a propane furnace, and a propane stove. We turned up the heat and unpacked. We were staying for 3 nights. After we were all unpacked, my next goal was to find the outhouse. We saw a small skinny and tall shed popping out of the snow about 40 feet from the cabin, but I had doubts if that was the outhouse or not. However, I didn't see any other building, so it must of been the outhouse. First I had to shovel and compact a narrow pathway to it, and to my shock, once I got there, it was indeed the outhouse! 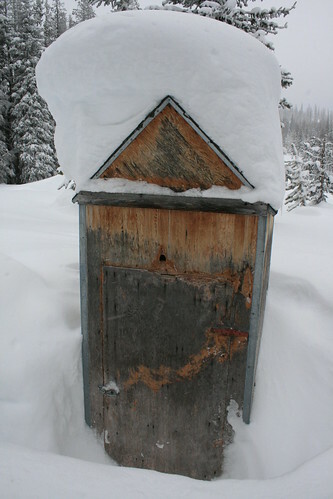 It was buried half-way by snow so deep that to get down to the outhouse door would be difficult. Luckily the previous visitors cut out a spiral staircase out of compacted snow that brought you down to the ground level. Once you were down the staircase and at the door of the outhouse, the snow level was about as high as the top of my head (about 5.5 feet)! How interesting! Breaking trail in the deep snow around the cabin. I liked staying at this cabin the best. 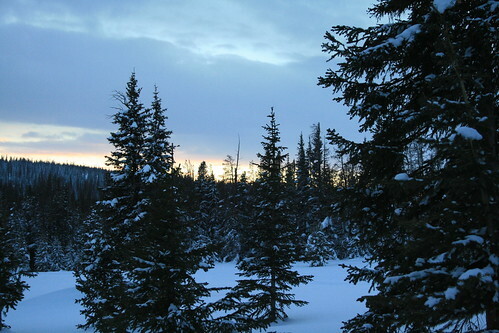 We enjoyed skiing around the forest during the day, exploring the wilderness around the cabin. At night, the forest was so quiet. Sometimes we saw the stars, but other times it was snowing. It snowed a lot while we were there, and we were constantly shoveling to keep the door free of snow and the path to the outhouse cleared. This cabin had a guest book, and we read all of the messages the past visitors wrote. Most people were from Wyoming or Colorado. We were one of the only ones from outside the immediate area to have stayed at the cabin. Most people stay during the summer, as there weren't too many messages from people in the winter. Although it was pretty cold outside (always well below freezing and overnight lows below zero) we were really warm inside. The furnace made a loud popping sound every hour (and more often if you had the temperature set higher). It kept scaring me, especially in the middle of the night. It sounded like somebody hit it with a hammer! Warning to those who might stay there in the future! The cabin from the side.